Los Osos is largely a bedroom community for San Luis Obispo which is 10.6 miles east, and to a lesser extent, Morro Bay which is 2.3 miles to the north. There is a small business district concentrated in just a few blocks along Los Osos Valley Road, and several shops servicing the Baywood section of Los Osos, near the bay. The rest of the town is almost entirely residential. Population is approximately 14,276 and total population at build out is limited to approximately 26,000. 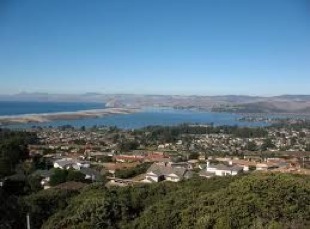 There are two roads connecting Los Osos to other communities: South Bay Boulevard, which leads to Morro Bay via Highway 1 and Los Osos Valley Road, which leads to San Luis Obispo. Los Osos serves as the entrance to Montana de oro State Park. Los Osos Valley Road reaches the coast at the south end of Estero Bay and continues south into the state park. Large groves of non-native eucalyptus trees attract the annually migrating Monarch butterflies to Los Osos.